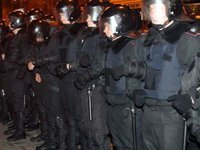 According to the agenda of the Monday session of the Ukrainian parliament, the parliament on Monday will discuss draft decrees banning and scrapping the special task force Berkut. Parliamentarians also plan to make changed to the parts of the 2014 state budget dealing with the costs of holding presidential elections in Ukraine. Among the issues on the agenda is the appointment of Victor Hvozd as envoy on intelligence activities control in Ukraine, a draft decree on remembering the people killed in armed conflicts during peaceful protests, and a draft decree on reactions to judge oath violations by Constitutional Court judges.